You’ve yet to disappoint me! Really loved Sadie’s story! Sadie is a sweet, naïve girl with a strong love for her family. She tries her very best to provide for her family, but forgets the most important thing along the way: trust in the Lord. Always. Aren’t we often just like her?? Trying to accomplish things on our own, forgetting that the Lord has promised to take care of us if we do things His way? Of course, Sadie’s lack of trust in God gets her into trouble – dangerous breaking-the-law kind of trouble. Seeing that the town’s sheriff has lost his heart to Sadie…well, yeah! What a tangled mess. Loved Shelva and Melva! I imagined the sisters on the Waltons – only taller, skinnier, and louder, yet loveable. 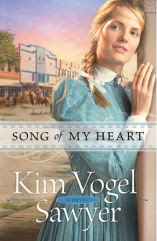 Really, all of Kim’s characters are always so real and likeable (except the bad guys, of course)! Keep writing, Kim! Your stories are sweet, yet realistic, and I love how easily you share spiritual lessons that we all need to be reminded of. Thank you for writing books that I can recommend! Thank you to Kim and Bethany House through CFBA for sending me a copy to read and review!